Cryptocurrencies continue their consolidation on higher ground. 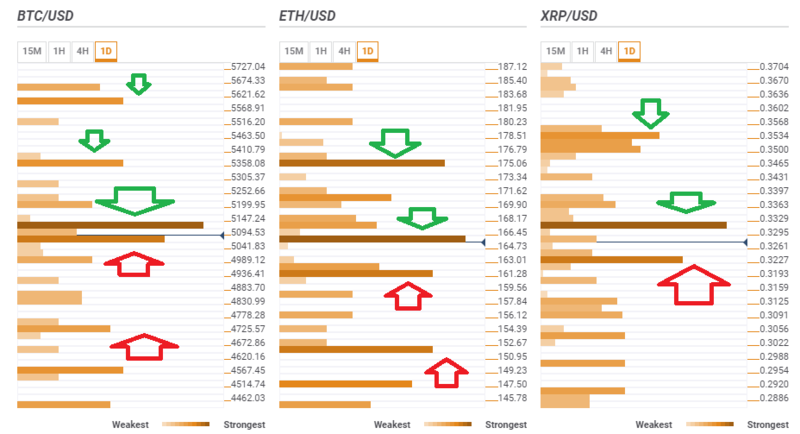 All top three digital coins have clear barriers to cross in order to resume the rally. Digital currencies have returned to limited range trading after the leap, and are looking for a new direction. As the weekend approaches, the next moves depend on breaking the next resistance lines. Bitcoin faces a plethora of resistance lines at $5,120 where we see the previous 1h-high, the Bollinger Band 1h-Upper, the Simple Moving Average 10-4h, the Fibonacci 38.2% one-day, the BB 15min-Upper, the SMA 50-4h, and the SMA 200-1h. If it breaks higher, the immediate target is $5,358 which is the meeting point of the previous daily high and the previous weekly high. Further up, $5,595 os the convergence of the Fibonacci 161.8% one-day and the Pivot Point one-week R1. BTC/USD enjoys support at $5,056 where the Fibonacci 23.6% one-week, the SMA 10-1h, the SMA 5-4h, the previous 1h-low, the Fibonacci 23.6% one-day, and the BB 15min-Middle all converge. Further down, $4,725 is the confluence of the PP one-month R3, the SMA 100-4h, and the PP one-day S2. Ethereum is struggling around $165.50 where a dense cluster awaits Vitalik Buterin's brainchild. This includes the Fibonacci 23.6% one-day, the BB 1h-Middle, the Fibonacci 38.2% one-week, the SMA 10-1h, the previous 1h-low, the SMA 5-4h, the BB 15min-Middle, and more. The upside target is $175 which is the convergence of the SMA 100-1h, the PP 1m-R3, and the PP 1d-R1. ETH/USD has support at $161 which is the confluence of the previous daily low and the PP 1m-R2. Further support is at $151 where the PP one-day S2 meets the PP one-month R1. Ripple remains weaker and must surpass $0.3315 to move up. This is the juncture of the BB1d-Middle, the Fibonacci 23.6% one-day, the PP one-month R1, and the previous 4h-high. It can then run to $0.3534 where two Fibonacci lines converge: the 161.8% one-month and the 38.2% one-week. Support is at $0.3227 where the BB 15min-Lower, the SMA 50-1d, the PP 1w-S1, and the SMA 100-1d all meet.